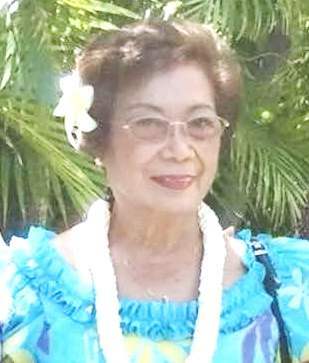 TEODORICA DORIS PANZO Teodorica "Doris" Panzo, 88, of Ewa Beach, employed for over 30 years with Liberty House Ala Moana Center in sales, passed August 6th 2015 in Kahului, Maui. Doris was born in Waianae, Hawaii. She embraced God, loved her family, and found happiness in sharing her hula. Her beautiful smile will be missed. Doris was survived by Sisters Ermina (Wilburn), Mary Rogers, Connie Kaopuiki; Daughters Cyrila (Jim) Pycha and Marilyn (Mark) Mohler; Sons Anthony (Trudy) and David (Debbie) Cole, Ron (Sandy) and Michael (Wendie) Panzo; Daughter-in-law Shirley Cole; Grandchildren Lora-Ly, Christian, Devin, Matthew, Angela, Tracy, Jody, Jeremy, Tessie, Joey, Tara, Teah, Collin, Jacob, Michael, Joshua, Nathan, Dayna, Kainalu, Michael Vincent, Brittany, Joshua, Veronica; and 18 great-grandchildren. Services: 12noon, Friday, September 25, 2015 at Hawaiian Memorial Park Mortuary. Inurnment 1pm at Hawaii State Veterans Cemetery, Kaneohe.